Normally, when a flea bites an animal there is a little to no irritation. If your pet has flea allergy dermatitis, it will experience intense itching and irritation from a flea bite. 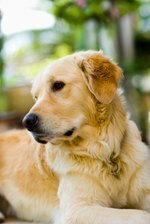 This usually leads the pet to scratch and bite itself, which can cause open sores and lesions on the body. These lesions can lead to infections. Luckily, there are a number of home remedies you can use to treat flea allergy dermatitis and help your pet find relief. An animal with a poor immune system is more likely to have an allergic reaction to flea bites than an animal with a strong immune system. Although there are many vitamins and immunity-boosting products on the market, one of the easiest and most natural ways to boost your pet's immune system is with a high-quality pet food. If you are unsure if a brand is high-quality, ask your vet or an employee at your local pet store for suggestions. However, if you are switching your pet's food, make it a gradual change by integrating a little of the new food every meal and decreasing the quantity of the old food. This will help keep your pet from developing an upset stomach. One of the most common symptoms of flea allergy dermatitis is the intense itching caused by the saliva of the flea when it bites your pet. Conventional treatments for the itching include either a prescribed or an over-the-counter antihistamine. If you are looking for a home remedy for the itching, eucalyptus, rosemary, fennel and yellow dock are herbal options. The herbs can be mixed together in equal parts and sprinkled on your pet's coat several times a week, discouraging fleas from biting. Before administering an herbal remedy, double check with your vet to ensure the particular herb is acceptable for your pet's breed and specific situation. Your vet also can provide specific dosages for your animal's size. Witch hazel is a plant that is made into a natural astringent. It is commonly used to treat hemorrhoids and other skin inflammations in humans. Witch hazel also is effective at relieving the itching associated with flea bite dermatitis. Bottles of liquid witch hazel are available at your local drugstore. Pour the liquid directly on affected skin or dab it on with a cotton ball. The witch hazel helps to relieve itching, soothe dry and irritated skin, and promote healing of open sores that sometimes occur with flea allergies. Proper grooming of your pet will help to relieve the symptoms of flea allergy dermatitis. Using a flea comb to brush your pet daily removes fleas and their eggs. Also, bathing your pet every one to two weeks helps wash away and kill fleas. Purchase commercial pet washes formulated for flea treatments at the pet store, or use liquid dish-washing detergent.